New York was pretty normal about portion sizes. For the most part, you either got what you paid for or way less than what you expected. So, we forgot that we were in the States for a moment, and forgot the lessons we learned in Chicago, and didn't inquire about what we were ordering at Junior's in Grand Central Station. We don't understand! How can anyone eat that much sugar? So much sugar that your tongue starts to hurt. You're not supposed to get injured while eating cake. Whose idea was it to serve slices so huge? It's all so perplexing. The root beer float was unnecessarily large too. It was delicious, and we hate wasting food, but we didn't want to leave with diabetes either. 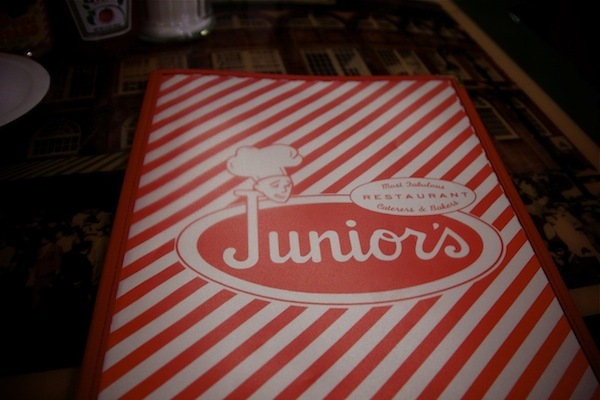 You should go to Junior's, if you have the chance because their desserts are very good. Just go with, like, 10 friends and maybe you'll get through one slice of cheesecake! Mina, we went to Juniors last weekend too! We felt the SAME way. We wasted half of the cheesecake slice. It was delicious but too much. Apparently, they freeze your nerve impulses so your brain dies and your body craves more sugar to jumpstart your system. Just kidding. That float and cake looks heinously criminal!!! Although, I"ll say "yum!" to that! That looks like my personal heaven! OMG, beyond yum! How do you not weight 300 pds haha? we ended up eating there too and the burger my brother had was ENORMOUS! the determination on his face to finish it was something we still talk about today....2 years later! Looks delicious but enormous. I hate wasting food! Maybe if I go I'll plan on bringing lots back home with me.